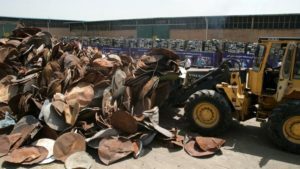 Iran has destroyed 100,000 satellite dishes and receivers that the government said were “morally harmful” to society. “The truth is that most satellite channels… deviate the society’s morality and culture,” Gen. Mohammad Reza Naghdi, the head of Iran’s Basij militia, was quoted as saying by Iranian state media. Owning satellite television equipment is banned in the Islamic republic. Violators of the ban can be fined up to $2,800. “What these televisions really achieve is increased divorce, addiction and insecurity in society,” Naghdi said. Naghdi said a million Iranians had “voluntarily” handed in their satellite equipment. Still, Culture Minister Ali Jannati said most Iranians own satellite equipment in violation of the law. He has called on authorities to amend the law to shut any loopholes.